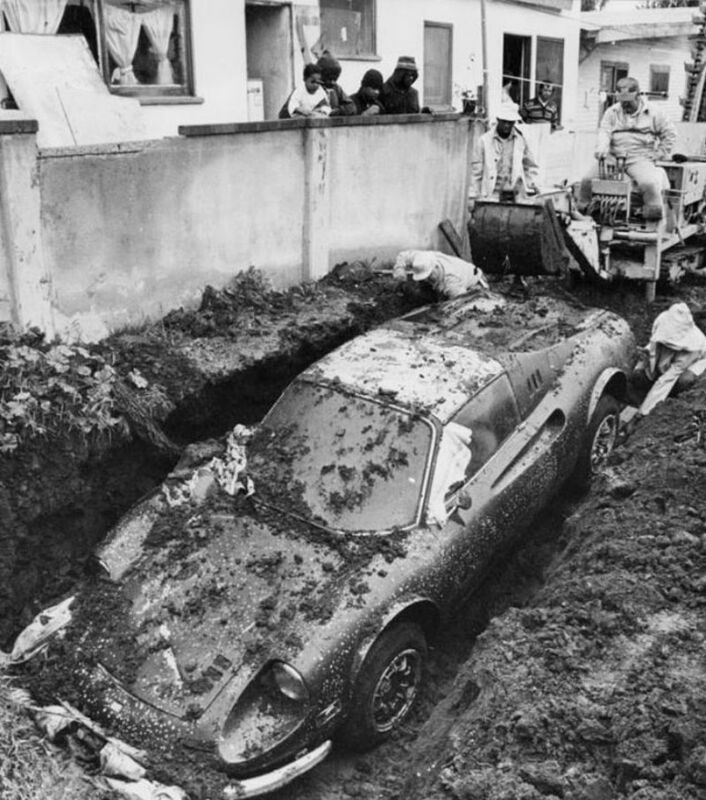 It was February 1978 and a group of kids were digging in the mud outside a house at 1137 W. 119th St. in the West Athens section of Los Angeles. Just below the surface, they struck something that felt like the roof of a car. They flagged down a sheriff’s cruiser. After assessing the yard, Sergeants Joe Sabas and Dennis Carroll decided that they would need to assemble a team. Later, Sabas and Carroll returned to the house accompanied by a skip-loader and a crew of diggers, who began removing tons of earth from the scene. 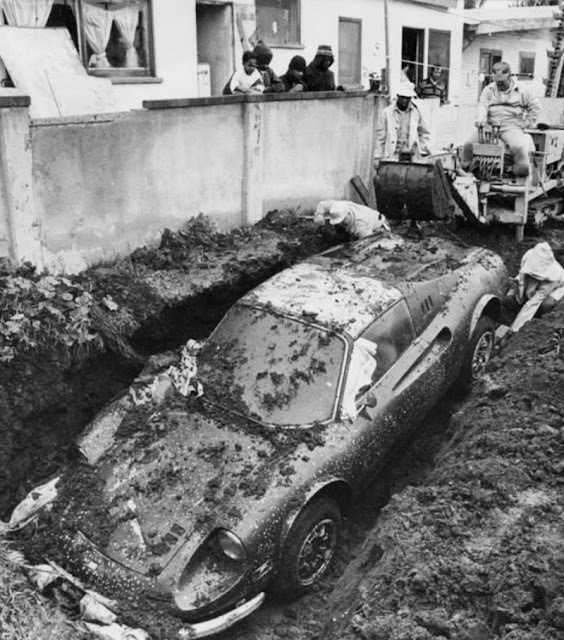 In fact, they painstakingly excavated the yard, finally exposing something so magnificent that it would become a permanent part of Los Angeles urban folklore. What did they find? 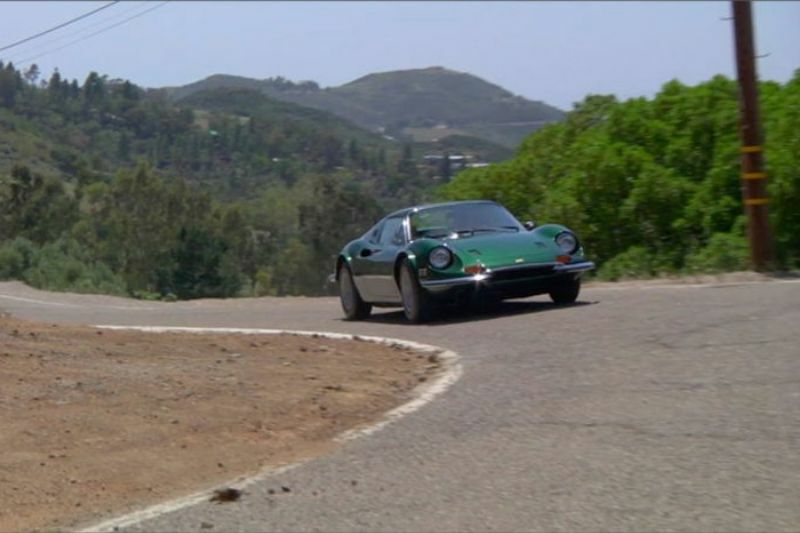 Nothing less than a 1974 Dino 264 GTS Ferrari – a singularly stylish vehicle then worth some $22,500, or around $110,000 in today’s money. Intent, Carroll peered through the grubby windscreen and saw no bodies or contraband visible. However, the car had been listed as stolen some four years earlier. The strange discovery immediately caught the eye – and imagination – of local reporters who saw parallels with the eccentric funeral of a certain Sandra West. It seemed that, a year earlier, Ms. West had died from an unintentional pharmaceutical drug overdose in Beverley Hills. 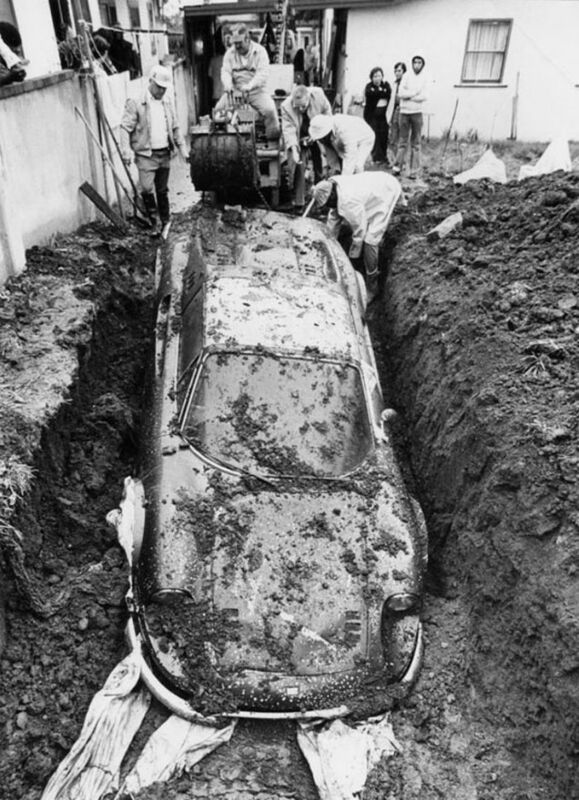 And her last wish was to be buried inside a Ferrari next to her late husband. But what of the buried Dino? Who had owned it, and how had it been stolen? 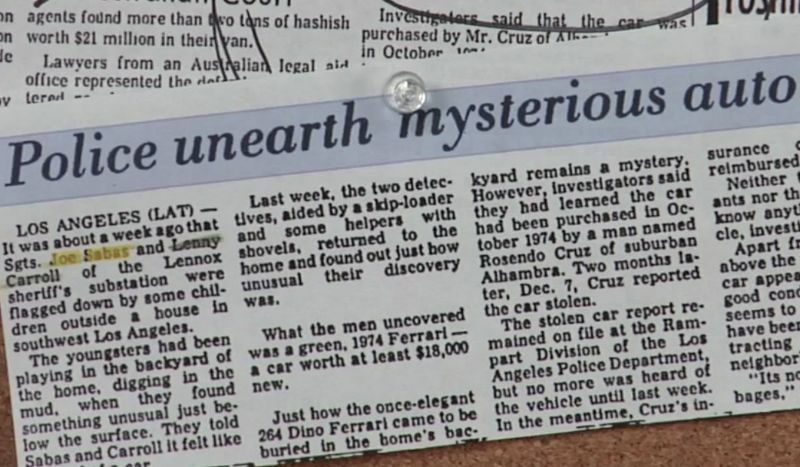 The Los Angeles Times only reported that the car had been procured in October 1974 by an Alhambra, California, plumber called Rosendo Cruz before it was stolen two months later. 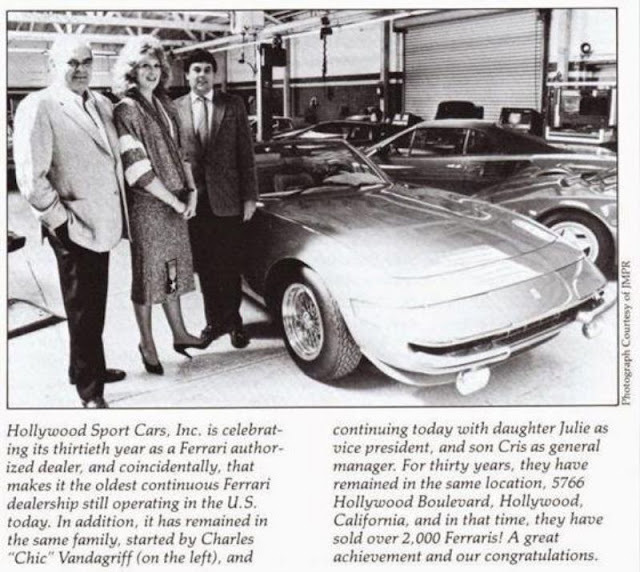 In fact, it wasn’t until 1986, thanks to some investigative work by Greg Sharp of AutoWeek, that some further details became public record. According to Sharp, the Dino was picked up by Cruz from Hollywood Sports Cars – the preferred dealership of the rich and famous – as a gift for his wife’s birthday. 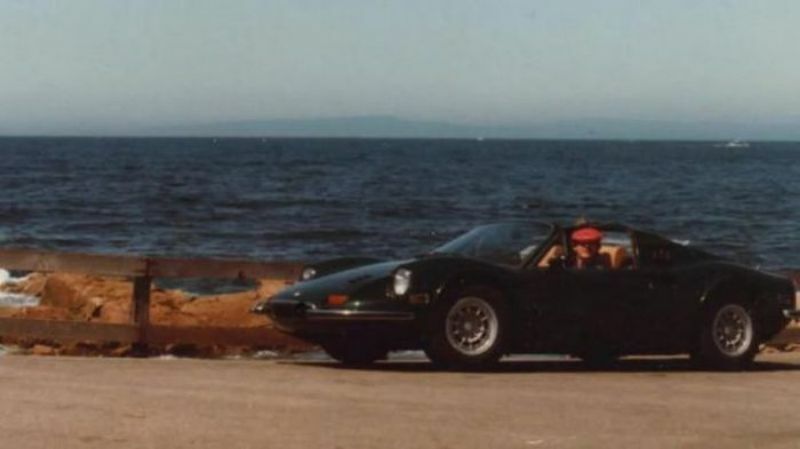 She drove it just 500 miles before the fateful night of December 7, 1978, which also happened to be the couple’s wedding anniversary. Sharp wrote that Cruz had apparently been spooked by “the anticipatory gleams in the eyes of the valet parkers” at the Brown Derby eaterie on Wilshire Boulevard. So instead of parking in the restaurant, Cruz had left the Dino on the street. However, when he and his wife returned from their romantic dinner, the car was gone. 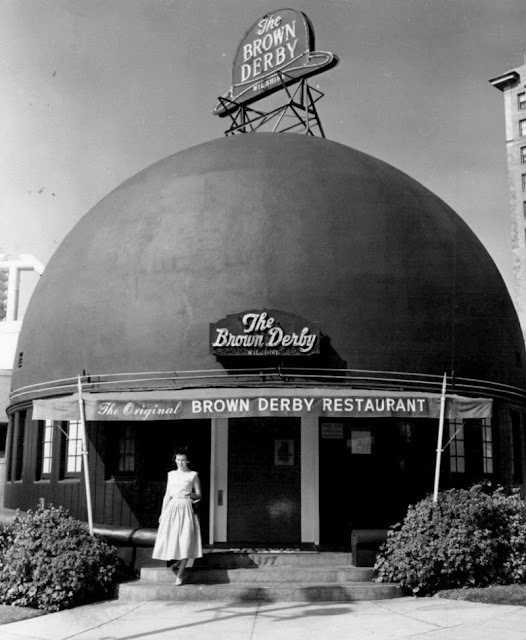 Entrance of the original Brown Derby restaurant on Wilshire Boulevard in Hollywood. In any case, the incident was written off by police as “righteous theft.” And, accordingly, Farmers Insurance group paid out the full value of the vehicle. This also meant that when the Dino resurfaced from the soil in West Athens four years later, it became the legal property of Farmers. Consequently, the company began receiving an avalanche of inquiries from potential buyers. 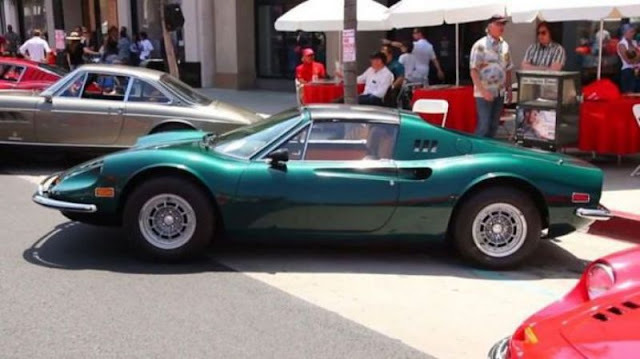 However, the interest in the Dino was largely due to slightly misleading reporting by Priscilla Painton of the Los Angeles Times. 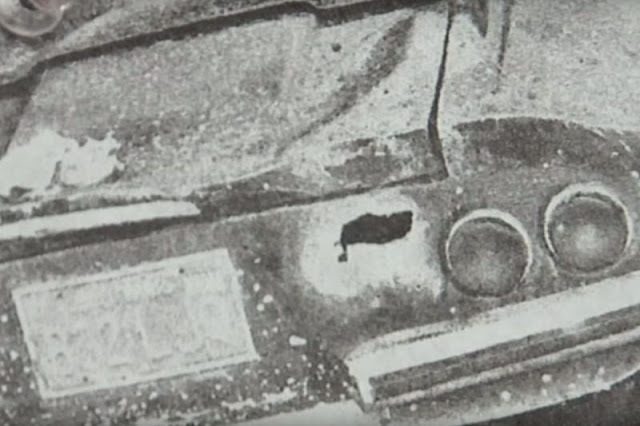 “Apart from a small hole above the right taillight, the car appears in surprisingly good condition,” she wrote. 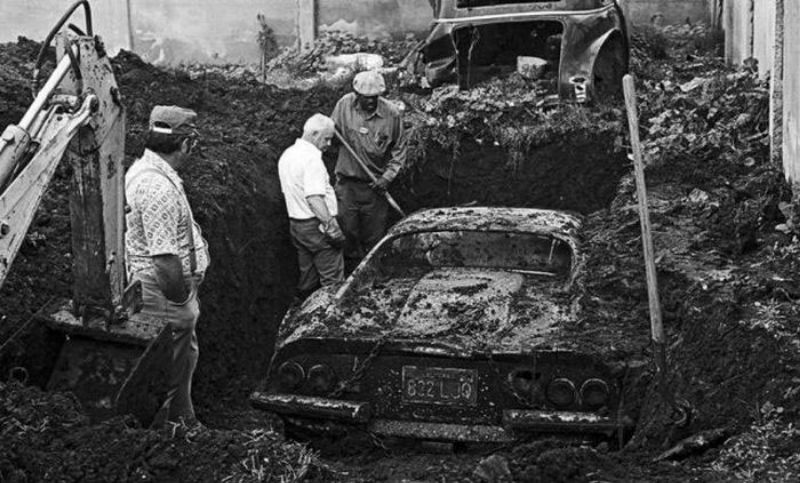 In fact, the state of the car was far worse than that. 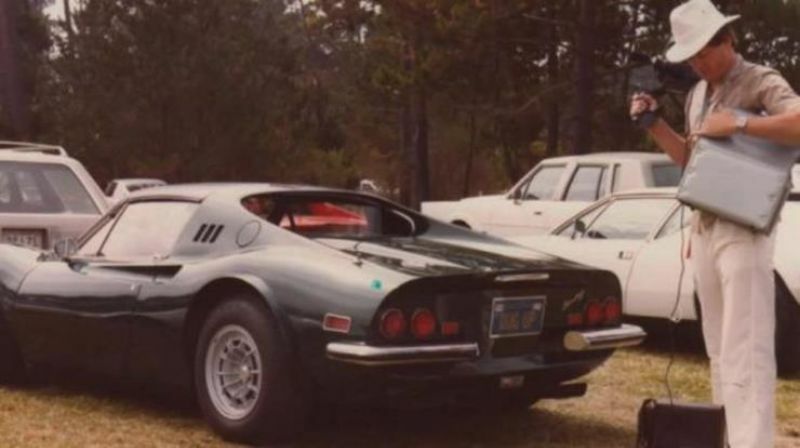 “The Dino’s 21 layers of paint (14 primer, seven paint) were freckled with white pox,” wrote Sharp in AutoWeek. 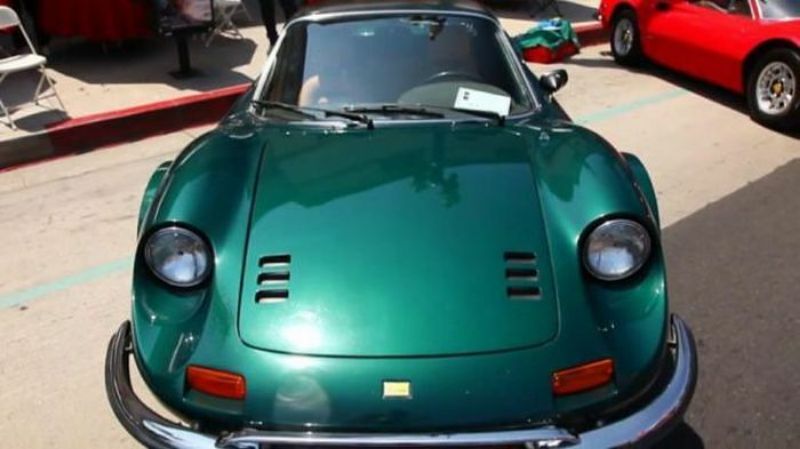 “Rust had eaten cancerous holes in the Pininfarina body and then spread everywhere, including inside the elegant leather interior.” What’s more, the insurance assessor’s overall assessment was so bleak that there seemed little hope of restoring the vehicle. Nonetheless, Farmers put the vehicle up for auction. 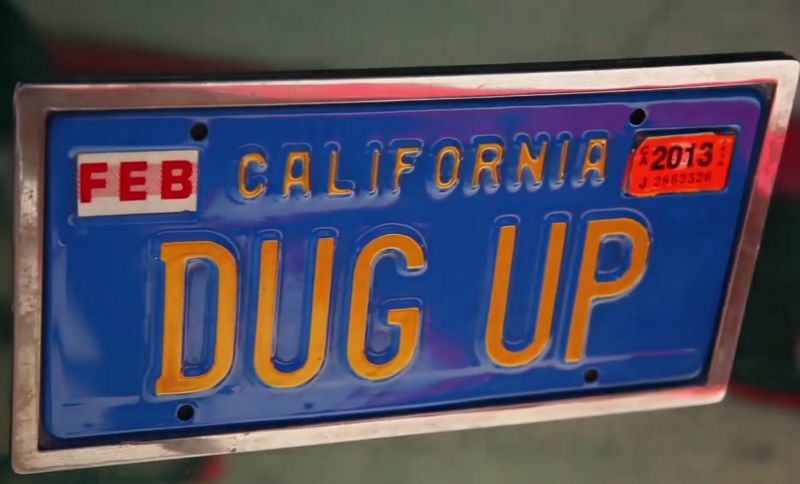 And though many of its parts were apparently pilfered while it stood on display in a warehouse in Pasadena, after weeks of bidding and re-bidding, it was finally sold for between $5,000 and $9,000 (or $18,000 and $32,000 when adjusted for inflation). His theory proved to be correct. Giuseppe Cappalonga, a talented local mechanic, set about disassembling the engine and repairing it. 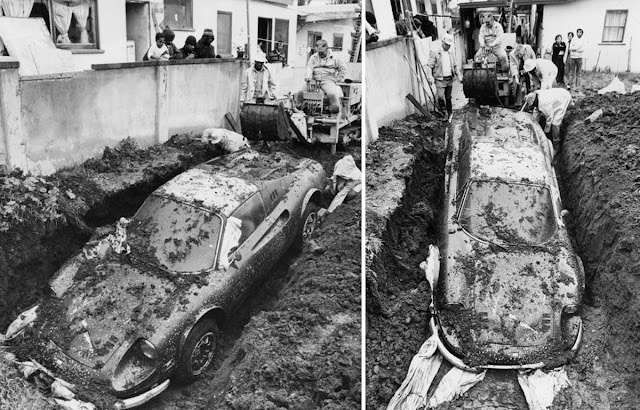 In fact, he managed to revive it at a third of the cost of an official Ferrari dealer. So almost 40 years on, thanks to his careful attention, the motor was still going strong. But Howard wasn’t the only person to talk to Spinelli after the publication of his article. 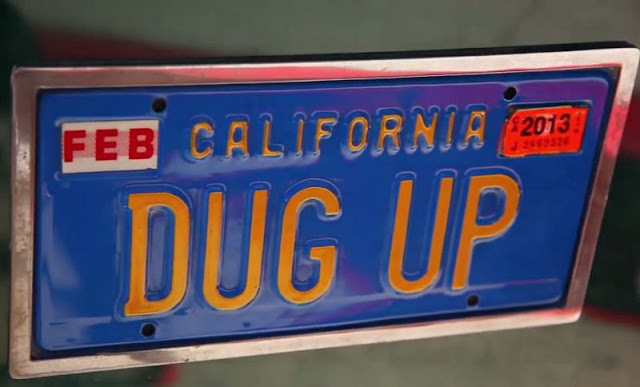 In an astonishing twist, Sergeant Carroll, now retired from the Los Angeles County Sheriff’s Department, explained to him why the vehicle was stolen in the first place and how it ended up in a backyard in West Athens. Strangely, it turned out that, contrary to what the Los Angeles Times had reported, police had not been alerted to the scene by any kids. In truth, that little detail was a cover story to protect a police informant. This informant had, in fact, led the officers to the yard with the claim that the vehicle had been stolen as part of an insurance scam allegedly orchestrated by the car’s owner, Cruz. According to Carroll, the thieves had been paid to steal the Dino and scrap it, but instead they’d buried it in the hope of one day retrieving it. In the words of Spinelli, “The hired guys clipped the Dino off Wilshire, all right, but they fell hard for her Italian curves. Just like the Huntsman and Snow White: they couldn’t land the dagger.” It’s a good thing, too: a car as beautiful as the Dino deserves a long and happy life. As for the thieves, they were never found, and the case remains closed.